CAD 2D and 3D wireframe drawing software. Is there a better alternative to Graphite? Is Graphite really the best app in Illustration category? Will Graphite work good on macOS 10.13.4? Graphite is a user interface that lets creative people get precision drawing and drafting done without worrying about how to run their software. 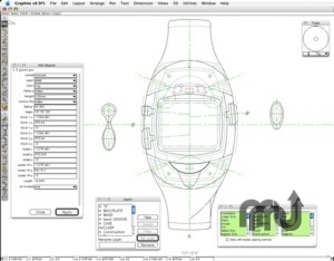 Create 2D and 3D precision wireframe drawings of unlimited complexity and detail. Whether you need a simple sketch, an elaborate architectural design or a precision engineering drawing, Graphite lets creative professionals express their ideas clearly and completely in the fastest way possible. Graphite is part of the Ashlar-Vellum Design Elements family of 3D modeling and CAD software for product designers. Version 9.0.15: Release notes were unavailable when this listing was updated. Graphite needs a rating. Be the first to rate this app and get the discussion started! Revolutionary Vellum Drafting Assistant facilitates intelligent snaps and automatic alignments in X, Y and Z. Advanced 2D and 3D equation-driven parametrics promote design variations. Preview symbol panel lets you intelligently place symbols in space. Multiple dynamic views keep your design changes up to date. Smart wall tool intuitively interacts with architectural symbols to speed sketching.